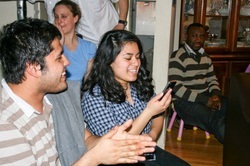 Darren doing sound at a special Hosanna event in 2007. By the way, I couldn't get over the great power of God over Darren's funeral service that day. My wife and I were absolutely in tears, and so of course were many others we could see around us. off, and it was the most amazing sense of the Spirit to see it happen at a funeral. If we would only understand that funerals are one of the greatest opportunities we have in bringing many into the kingdom of God, what you were able to do that day should be done at every funeral service. Keep up the great work my brother. Pastor Joseph's Comment: This testimony is a tribute to JESUS and Darren Simpson, who truly gave his life so sacrificially and unreservedly for His LORD and many others, while labouring together with us to establish GOD's vision for Hosanna in Toronto, and FSM in the nations. He's a true "son in the Gospel" who loved Betty Ann and I with God's unconditional love. We miss you dearly. See you soon in Heaven! "Just wanted to say, i love you all so much. You are all the greatest family anyone could ever have, and i'm so privileged to be alive to know every single one of you. Some of the BEST youth in the World! "You have been such a blessing, not only to the adults, but the youth as well. We love and appreciate you for always being there when we needed you. 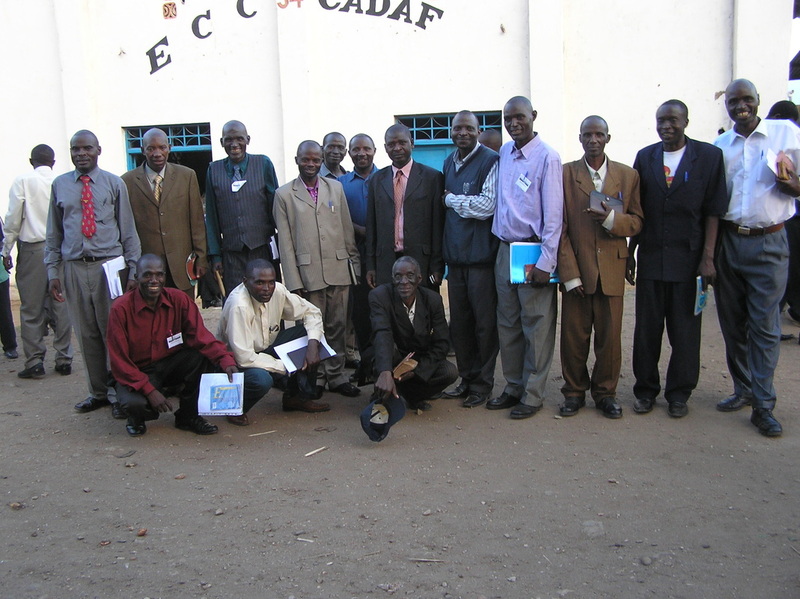 FSM Pastors from Goma, D.R. Congo - 2011. Even though you see them smiling because of JESUS, many need Bibles and song books destroyed by war. Thank you for sending me the teaching and preaching about Healing, Reconciliation, and Deliverance. I have read and examined it. It is practical. They are wonderful teachings! Thank you for this, and for your money supporting us every month (new church plants in DRC). God bless you. The Church is growing very well. Sunday last week, we decided to put the Name of our Church as SHALOM or PEACE because of your teaching that you’ve sent to me. In reality, they contain Peace and Reconciliation. Nowadays, our FSM church is called SHALOM Church. Dr. Joseph, I confirm that this teaching in our country is coming on time. Our members and I are blessed. Much love in Christ, Dear Sir. mercy upon His children, especially in Asia. Now I have about 400 (four hundred) believers within our FSM, only in Hubli. new believers are coming in. As such, we now have a powerful worship team! No 1. Now we have donated a land near Bangalore, about two Acers of land, which is 5 km away from the new international airport (Devanahalli). Bangaloreis just miracle! One of our FSM pastors prayed for the landlord’s son and he got cured. And they have donated this prime land. Last week, Mary and I went to see it. This is one miracle! No 2. The “hundred houses project” which was pending since last 4 years has come to a positive. We got 3 Acers of land in Hubli, just on the outskirts. This is where we can distribute 100 houses. I’m also planning to take government help. If it is so, then we can build 1+1 = that is, 200 houses! And, it’s all only belonging to our FSM. wonderful worship, outreach, and distribution of tracks. Much more, we need more prayers from FSM Toronto, our parent church. Sir, pray and inform all of our FSM India and TCIF in Canada. praise and glory of GOD! Ananie (FSM Rwanda, DR Congo, Burundi). "Why did I go to Rwanda?" Rwanda in my heart many years ago. I still don’t understand how. My former boss with a mission’s organization had been to Rwanda, and when she shared about her experience, I just knew that one day I would go. the nations. I knew some of what FSM was doing – equipping leaders, establishing prayer worldwide, sharing the gospel – but I knew there was much more than I was currently seeing. I longed to see more. initial partners when GOD launched the FSM vision in 1999 (see last page for FSM’s eight purposes). By God’s grace manifest through many faithful disciples of Jesus Christ, Free Spirit Ministries has become an expanding network of churches and ministries in Africa, Asia, the Middle East, and North America. Although Joseph and Betty Ann have also taken ministry teams and ministered in many other countries in Latin America, FSM international has been their major focus for the last ten years. I’d heard about Dr.Joseph’s missions to the nations and how mightily God moved. But now I wanted to see this first hand and be involved, and help pastor Joseph when I could. I also knew that God would change me. I just didn’t realize how much changing really needed to be done in my life. just needed to have an encounter with Jesus – to experience Him in a new way – and I believed that would be what I needed to get me moving and growing. Before we left, pastor Joseph asked if I wanted to be coached. While I wasn’t quite sure what that would entail, I realized that this was part of the answer to my prayers –part of my desire to become what God had for me. So I agreed. And God had prepared me for this, too. I’d seen friends walk away refusing to mature and receive God’s correction, remaining in their pride. I did not want this to happen to me. So I prayed that God would help me to recognize my sin and deal with it. I didn’t want to fall away from Christ like others I’d seen. I have to say, however, that this was one of the hardest processes I’ve ever been through. When confronted with my sin, I was hurt and my pride was raging. I realized that the very things I was doing to protect myself were actually hurting me and others. I was disgusted by the truth about myself. Thoughts raced through my mind. I wanted to run … but when you’re in Rwanda you don’t have anywhere to go. I wanted to escape. I thought about leaving the church and walking away. This was part of my coping strategy. I rationalized that no one would miss me. I thought, “They may miss me doing the things that I do, but no one would really miss me personally.” These were the ungodly thoughts I was dealing with. will. But,“If we confess our sins, He is faithful and just to forgive us our sins, and cleanse us from allunrighteousness” (I John 1:9). Don’t stop believing that God can and will forgive you. Don’t stop asking for His forgiveness. This will only perpetuate your cycle of guilt and shame and defeat. Don’t remove yourself from the good race of faith. shadow of these things. Lord … help me to see my sins for what they are – not to bring condemnation, but to bring repentance, forgiveness and freedom. Pastor Joseph had spoken to me about not allowing guilt and shame to take hold. This was so new to me. All my life I thought that it was “normal”to feel guilty and shame when faced with my “sins”. When God brought this understanding to me, it was like a paradigm shift in my spirit – I didn’t have to feel guilty. I didn’t have to stay in my shame and self-condemnation. The purpose for having our sins exposed was to bring repentance and forgiveness – not guilt and shame! This was so freeing. When I finally surrendered to the Lord, it was like a weight was lifted from my heart, and I was able to see clearly. The voices of condemnation and discouragement stopped. I was free. Pastor had told me not to fear dying to self– he said it was a beautiful thing. Now I understood! The next day, I felt different. I wasn’t perfect – God continued to use pastor to bring light to other dark areas – but the transformation had started. I wanted to praise and dance before the Lord. I wanted to love the students at the Bible School. I wanted to get to know them. God had started to change me. And because God brought me through this experience, I was able to receive further correction. I realized that seeing my sin was not going to kill me – Oh, the “old Laura”would die, but the person God wants me to be will grow stronger. In one session of the Bible School, pastor Joseph taught that we should not “be offended when God challenges us to grow.” I know that taking offense is so easy to do – but it does not bring freedom and growth. to be coached. I choose to repent. I choose to listen to those in authority. I choose to face my sinful nature. Every day I must choose life. Like Paul, I must continue to choose to “die daily” so that I can truly live (I Cor. 15:31; Matt. 16:25; Mark 8:35; Luke 9:24, 17:33). I know this was just the beginning of God’s process of transformation in my life. It felt huge… but there is so much more. Now I’m “confident of this very thing, that He who has begun a good work in me will complete it until the day of Jesus Christ”(Phil. 1:6). As long as I remain teachable, humble, and faithful, God will continue to work in me. He won’t give up because He sees the end product! While in Kigali, we stayed in the home of pastor Ananie, the overseer of FSM Central Africa (I learned later that we were the first white people to stay in his home – but this is another story). In his living room there were two pictures – one of a deer, and the other of a lion. When I went to Rwanda, I was like the deer. I just wanted to stay safe, stay out of trouble, and do my thing quietly to avoid confrontation. When faced with confrontation there are three ways people normally react: Fight, Flight, or Freeze. I would either run (flight), or I’d freeze – like the proverbial deer in the headlights. I’d fight internally, but suppress the anger. This would often appear as stubbornness or passivity. God is healing me in this area as well. Now, I’m being transformed from the deer into a roaring lioness in Christ. God’s working in me to transform my heart and mind so that I’ll think of myself as He thinks of me. He does not see me as a “helpless deer.” He sees me with the powerful potential He’s given me through the “Lion of Judah” Christ Jesus. I am His – I have His authority! A lion doesn’t worry about the same things that a deer does– the lion knows there are few things that can harm him. Similarly, when I see myself as a child of the King – with all the rights and privileges – I no longer need to wonder about the lesser things. I can be about my Father’s business without fear. But I must recognize my responsibility as a child of the King. One of the things I realized about myself is that I’ve spent so much time protecting myself, that I’ve missed so many opportunities to do what God’s called me to do. broken glass to stop people from climbing over the wall. But growing behind the wall was a beautiful vine with flowers. It was visible over the top of the wall. When I saw this, I thought it was a great picture of me. I have a lot of good stuff to give, but I was so fearful that I built a wall and put glass on top to make sure no one came over to my side. I could see over the wall into the world, but the same sharp glass that kept others out has kept me in. But with my cooperation, God is removing the broken glass and the wall. complete freedom, real love, and genuine friendship. He wants me to grow and be transformed into His image. God has even transformed my thinking in this respect – although I know I don’t fully grasp this yet. However, I know He has more for me to do than what I’m currently doing. What is Free Spirit Ministries? FSM is not simply a little charity where a few people are helped out and some people hear the gospel and are saved. FSM is part of God’s transforming work in nations to establish His Kingdom and will on the earth. The equipping, the provision, the training and support given to our co-labourers overseas are changing not only individual lives and families, but the spiritual fabric of entire nations! FSM trains and equips national and international leaders. This isn’t just on the religious front – or what we call the “religious mountain”. God is using FSM to reach and equip leaders in all aspects of society – government, economic, education, religion, media, celebration, and family – what we call the seven major “mountains” or “summits”. taken back in JESUS’ Name and for His glory! National prayer is changing the moral fabric of nations! God is moving! While in Rwanda, I was impacted by how sacrificial FSM leaders are, and how pure their relationships are. For example, while our Canadian team chose to stay in homes instead of expensive hotels, our Rwandan brethren rose to the challenge and gave sacrificially to provide for our physical needs with places to stay, clean water, good food, and transportation. And staying in bishop Ananie’s home was a special blessing, as we were able to build covenant relationships, not only with Ananie and his family, but with the many other leaders who stopped in to fellowship and receive all that God could pour into them through pastor Joseph during this time. There were many late nights with men and women of God talking with pastor Joseph, eagerly absorbing all that God had to offer. In Canada, I’d heard pastor Joseph say that FSM does not ask the churches and leaders for money, and that we give freely. But now I was able to see this first-hand in Rwanda. The FSM network is being built by sacrificial faith and humble obedience. And it was amazing to be a part of this! 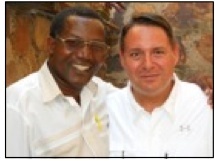 § Reach out to and disciple and minister to many souls in Central Africa. § Powerfully ordain FSM leaders and their wives, including bishop Ananie and his wife Immaculate. § Give pastors and leaders memory sticks with volumes of training manuals for free – they can even give away Dr. Joseph’s manuals to others, but were asked not to charge for the materials or to take credit for them. § Give bishop Ananie hard copies of pastor Joseph’s manuals for his use. § Thanks to donations, we were able to take soccer shirts and balls in our luggage to give to pastors and their families – pastor Ananie is now able to start significant“football” outreaches to youth in Africa. § Purchase tires for our landcruiser – this is a well used vehicle and belongs to pastor Ananie. He uses it to travel to our forty plus FSM churches in Rwanda, as well as our churches and missions in DR Congo and Burundi. The vehicle was used by our team while in Rwanda. After four flat tires, we realized that new tires were in order. Thank God that Hosanna and FSM had funds to bless for this vital need. § Purchase a property for one of our Rwandan churches. They had been seeking a property, but did not have the $400 US needed to buy the land they wanted for their church building. An average offering for a larger FSM church in Rwanda is a mere $5-10 US a week. § Experience God save and heal many souls through “spontaneous” outreach and crusades. § Disciple and prophesy to nations, in order to establish God’s Kingdom and will in the earth and their nation today – the seven summits! Now I realized just how much could be done for so many, with so little – and this is just a fraction of what we saw and experienced. And what about the transformation in the leaders – I was there and it was amazing! The students at the Bible Colleges were changed and truly challenged to move out of their“religious” boxes into their society and bring God’s Kingdom purpose and rule in all areas. I could see the lights go on for so many leaders. It was as though God had opened their eyes to see new possibilities, and new hope grew from that. They saw how to get involved in many new ways. Now they could be a part of changing their government, their educational system, their legal system, even the media – all the mountains (Isaiah 2:2). They realized that there was so much they could be doing with true and greater spiritual authority. I’m still in awe of the faith of our FSM pastors and leaders– they truly live by faith – day by day – trusting God to provide for their needs, and for the needs of their families. church offerings. He calmly responded that he prayed for God’s provision, and during times when he and his children waited for God to provide, they would simply fast and pray. Sometimes, they fasted and prayed for two or three days before God’s provision was manifested. It made me think about how shallow and selfish my life is. We have so much here in Canada! Even the poorest among us has not been forced to fast. We complain so easily about little things – how the chairs don’t have padding – while the churches in Rwanda either use plastic chairs or bamboo “planks” balanced on pieces of stone. We murmur and complain when we don’t get the food we want when we want it, while Rwandan pastors believe God for each meal and monetary need. We grumble about traffic and weather we have to drive through to get to church, while Rwandans walk for miles on unpaved roads and joyfully worship God and fellowship together. We complain about our Government and about how much we pay in taxes (even when we fail to exercise our responsibility to vote). Yet we usually have money left over after we pay taxes … not to mention the benefits that come from our taxes like public education, police and fire services, healthcare, public transportation and roads, and municipal services. After all, we’ve never had to live with such corrupt government or experience genocide in Canada– right? children made in God’s image. Read God’s Word – abortion is murder – innocent blood is being shed across the land of Canada. Read the United Nations definition of “Genocide” and you’ll quickly discover that by the UN’s definition of “Genocide” – if you’re truly honest – Canada and many Western nations are committing horrific genocide today! We think we’re so enlightened and say, “We are rich and have become wealthy, and have need of nothing.” Yet, we do not “know that we are wretched, miserable, poor, blind, and naked” (Rev. 3:17). …“There’s enough light in our church to light the whole nation of Canada.” While I’d heard these words before, now I’m able to see how God is using our so-called “small church” to change nations! I used to see Hosanna with limitations and small thinking. I thought, “We’re a small church with no star players.” We don’t have a choir. We don’t even own a building. I thought, “We’re just a ragamuffin group in a poor, high-crime area of Toronto.” Although in Jesus day, we could’ve been a bunch of fishermen and tax collectors. And just like the apostles, God is using the ordinary people of Hosanna and FSM to be a light to nations – including Canada! Now I see that God is able to use Hosanna precisely because we are small now. In first Corinthians 1:27 – 29 it says, “God has chosen the foolish things of the world to put to shame the wise, and God has chosen the weak things of the world to put to shame the things which are mighty; and the base (insignificant) things of the world and the things which are despised God has chosen, and the things which are not, to bring to nothing the things that are, that no flesh should glory in His presence.” Although Hosanna appears to be weak and small, we are like Gideon’s Army. God has allowed our numbers to thin out recently, so that He can work mightily through us! Do not ever become discouraged and despair! God tells us to keep our eyes on JESUS, He is the “Author and Finisher of our faith” … not us. When we look at our failures and shortcomings, we stop looking to JESUS. Every morning I still have to refocus and ask myself, “Am I willing to die today?” Each day that I answer “Yes Lord, I’m willing to die to self today” … God brings new life! He’s always faithful and trustworthy. God is using the “ordinary members” of Hosanna and FSM who “die daily” to change entire nations! He’s already done it! He’ll do it again! Blessed be the Name of the LORD! His only limitation is our willingness “die daily” that Christ may live through us with His life – “Christ in you, the hope of glory!” Will you establish God’s Kingdom and will in all the earth … as it is in Heaven? It’s your choice. It’s your free-will offering unto the King of all Creation! But oh, it has such great rewards, both now and forevermore! Where do you stand? Are you willing to “die daily” so that Christ may live through you today? If not, what’s holding you back? Jesus Christ’s Return is nigh, even at the door! Do not be a “foolish virgin” at the Bridegroom’s Return (Matthew 25). Our prayer focus begins in FSM churches and ministries with a passion for souls (Isaiah 56:7; Revelation 5:8; Luke 18:1; Matthew 28:16-20). relationship, not a product of division (Ephesians 3:8-12). You don’t have to renounce any legitimate ministry relationships in Christ to be part of FSM. FSM makes no financial commitments. But we experience God’s provision in many ways. Our focus is on freewill giving. We believe there will be an increasing release of provision as we obey Christ (Deuteronomy 8:18). As God directs, we work together to provide for God’s purpose (Acts 20:35). This will be done with prayerful agreement. Those ordained in FSM (apostles, prophets, pastors, teachers, evangelists) must have a Christian leader nearby who they prayerfully select: 1) to regularly minister to them; 2) and begin this relationship within (4) months of ordination or resign from FSM. The leader does not have to be in FSM, but they must be in basic agreement with your calling and FSM’s eightfold purpose (Ephesians 5:21; Titus 1:5-9; Acts 14:23; John 15:16). Husbands and wives are ordained together. These teams are spiritual SWAT Teams - Servants With A Target. They mobilize only as God gives the mandate (Acts 13:14). Background: After seven (7) years of faithful prayer, preparation, and giving ministry,Free Spirit Ministries and Hosanna Church (TCIF, Toronto) sponsored a five week Mission to India. 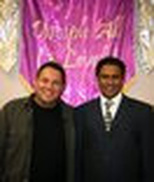 Apostle Joseph Grubb, bishop Krupadanam and the Team ministered together in five Provinces. It was an miraculous journey that demonstrated the salvation and power of JESUS CHRIST today! Many souls were saved and healed. Many churches planted and strengthened. Many servant leaders in the fivefold ministry equipped because of GOD’S manifest grace today. This testimony of Ajarayya Solomon was emailed to me. What follows is only a sample of the great outpouring of GOD’S SPIRIT that happened across India in 2007 and beyond. We are truly living in the last days before CHRIST’S return (Joel 2, Acts 2). And yes, we give ALL praise and ALL glory to the ONE who alone enabled us to do these “greater works” in HIS NAME (John 14:12). We love and thank You JESUS! You reign over ALL! Pastor Ajarayya and Dr. Silas (gynaecologist) had travelled many miles to be with us in Hubli, Karnataka. During this time, God uniquely ministered to them both, imparted a new anointing, and knit our hearts together in Christ. What follows testifies to what happened next. It is amazing, but true! Our GOD is awesome! Thank you pastor, I will go! You imparted to me a fire anointing fuelled by the grace of GOD. Pastor, I tried to call you, but some error. I’m travelling to many villages, and many people are receiving the LORD. I’m sending a message for you; *MY PRESENCE SHALL GO WITH THEE (Exodus 33:14). Praise the LORD Pastor! It’s such joy to talk with you. By the grace of the LORD and your prayer, now I have 120 churches. This is all the pastors working with me. Please pray for me. I hope you soon visit INDIA again. My prayer is for your ministry. Now we are all praying for you and Sister Betty Ann. Please visit once again. All my pastors want to see you. The way you are preaching is amazing, so we want to hear you again. God Bless you. Yours in Christ. India? Please, explain more about the 120 churches? Did this all happen since we met? How did God do all this? Praise GOD! Praise the LORD! Pastor, after your prayer for me, I went to preach one meeting. In that meeting, God did mighty things. So many were healed by GOD, and more than (300,000) of people accepted JESUS. After that, many pastors came to me. Now, we have good fellowship. I’m sending you pictures. Please visit. All the churches I’m now doing ministry are in different places. Please pray, I need your support and special prayer. Please pray for this. Your brother in Christ. What observations do you make when looking at this picture? We notice the hungry lions with closed mouths and Daniel standing with his hands behind his back. Do you also see the most important detail? Daniel doesn’t have his eyes on the lions; he has his eyes on God. Even during adversity, we should always focus on Christ and His Word, not on the situation, conflict or fear. Warmest greetings to you in the mighty name of our Lord and Saviour Jesus Christ. Just a short message to thank you for allowing the three weeks mission in Rwanda, we praise God for how He used both you and the team, we miss words to explain how the Holy Spirit led you wherever you have gone (RWANDA & D. R. CONGO) for ministries. We give thanks to God for all spiritual seeds you planted in many hearts... plus the students for Kigali and Kabaya Faith Bible Schools. We give thanks to God for the Ordination events, we remember how the Holy Spirit moved! also thank you for the repair funds for the water (radiator) which we are fixing today. Thank you for all encouraging words received from you, Laura and Dom. Again thank you, we'll never forget how your visit was so special and meaningful to us, including my family, we miss you! FSM Rwanda, D. R. Congo and Burundi. May the peace from the Lord Jesus Christ be with you, we praise God of what He is doing in our midst. Please I want to thank you with all my heart of what you you have done in Rwanda and Congo during your trip mission. years as students. 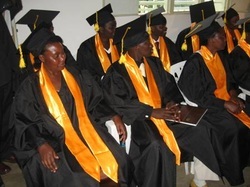 I profit this occasion to thank you for the courses you taught them, but not only students, but also church leaders and members who have heard the anointing teachings. Personnally, I do thank you for many things you have done and particularly, wherever I go for the first time, I have decided to teach the message of the Double Portion (Elijah and Elisha); explaining the steps from Girgal, Bethel, Jericho, Jordan and over Jordan. Many are sending thankful testimonies for these kind of teaching you brought to Rwanda. Thank you so much for the teachings on flash, plus books, they are very very useful in our training program. We are praying for more provision to come to you, so that you may continue blessing nations, helping to expand His kingdom. Please do plan any church planting again ? Thank you very much and I wish you the Happy New Year 2011. Greetings from Pastor Kalyan . Thank you for your prayer. By the grace of God and your prayer our recent baptism went well. I just come back home today morning at 5 a.m . I had to travel whole night. The place where we had to arrange for baptism was not easy. In that areas few years back (3) believers and workers were killed by a Muslim fundamentalist group. But after their death, God is doing now wonderful works in that area. Now we have a church and school there. We have nearly 180 students in our school. Yesterday we baptized 12 people and all of them are from Muslims background believers. Praise God for that. Now the situation is like that we can conduct baptism every month. But there are risks still in that area. Our believers are very open now. We consider the security that is why we arranged baptism very secretly inside the bathroom. There was water in a bucket and with a mug we poured out water on their head. Normally we do the immersion of water, but security reason we had to do it. We baptized total of 12 people. The picture could not come clear because of dark. But you can see when we took picture together out side of the room. All those elderly and adult people took baptism. It was a great joy to baptize those people together. Our church planter Amzad taught them last couple of months and finally before I had to sit together with them again and taught different way about baptism. We prayed together for them then we arranged for baptism service. My request to you, please pray for them and some of them are very poor . I am planning and praying for them to help them to give a female cow each family, so that they can sell the milk in a local market and slowly they can develop their families. Please pray for them also to transform their lives. We are praying that God will do supernatural works in that area, so that more and more people will to Jesus. Note about Bangladesh: Together with Kalyan, our new church planting pastors, Joseph Grubb, and Hosanna ... we praise our LORD that four (4) new churches have been planted in Muslim areas (2011). They are growing and not afraid to follow JESUS their SAVIOUR!